In Manager, you can import recordings into either a single study or multiple studies. Use a project to organize the studies in Manager. A project can contain one or multiple studies. When you import a recording into a project and begin adding markers, tasks and clips, the original recording (.rdg) file is not altered. Any markers, tasks or clips created in the project are saved within the project, not the recording file. You can only have one project open in Manager at a time. Open Manager. The Welcome to Morae dialog box appears. Select the option to create a new project. Click OK. The Project Name screen of the Create New Project wizard appears. 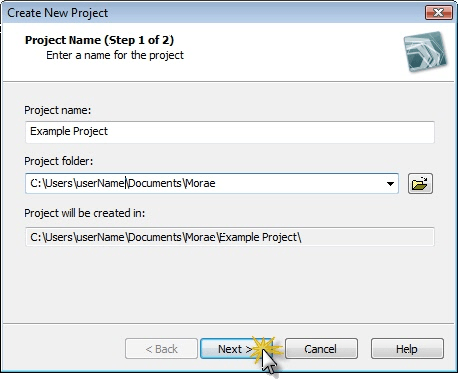 Enter a Project name and type the path for the project folder, or browse to locate the folder. Click Next. The Import Recordings screen in the wizard appears. Click Add to browse for and select the recording files to import into the project. You can import Morae recording (.rdg) and standard video (.avi, .wmv, .asf) files into a project. If the recordings you import in the new project are password protected, a dialog appears asking you to enter the correct password. 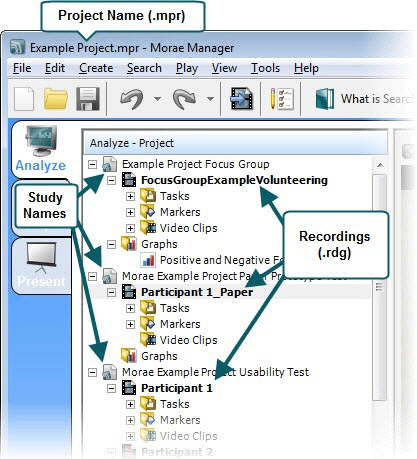 If the study configuration files match, the new project containing the selected recordings is added to Manager's Project pane and the recordings are in a single study. You can now start to analyze your study. If the study configuration files do not match, you can merge the recordings into a single study. 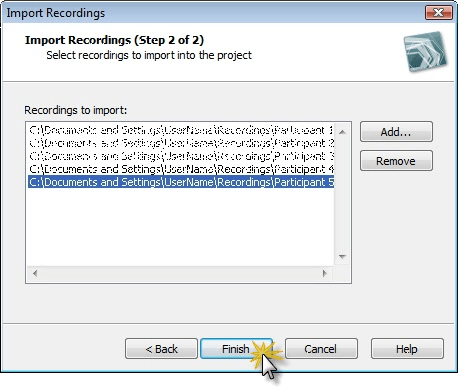 You can import additional recordings for analysis into a study or create a new study for the recordings in a project. 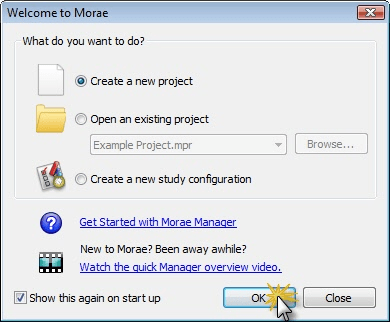 Click the Open Project button to browse for and open an existing Morae project file (.mpr). Choose File > Import > Recording or click the Import Recording button . The Import Recording dialog box appears. Browse to locate the folder containing the Morae recording file(s) (*.rdg). Select .rdg files and click Open. If the recording(s) you import are password protected, a dialog appears asking you to enter the correct password. If the study configuration files match, the new project containing the selected recordings is added to Manager's Project pane and the recordings are in a single study. After you import recordings for this project, you can begin using Manager's analysis tools to view and sort through your data. In addition to Morae recording files, you can import video files including .avi, .wmv, and .asf into Morae Manager. Video files, created by an application other than Morae Recorder, do not have the same set of searchable RRT data streams (i.e., mouse clicks, web page changes, application events, etc.). However, you can set markers and create tasks in these videos and incorporate portions of these videos into your highlight video presentation. To import a video file, choose File > Import > Video and locate the video to import. Click Open. Manager's Project pane allows you to organize your studies, recordings (.rdg files) and imported video files (.avi, .wmv, or .asf). When you create tasks, markers, graphs, and clips, these elements are stored in subfolders under the recordings in the Project pane. Under each recording in your project, Manager creates default subfolders for Tasks, Markers, and Video Clips. In each study, Manager creates a Graphs folder. In the project, Manager creates a Title Clips folder. You can create new folders to add deeper levels of organization. However, each item must always reside in a subfolder of that same type. For example, tasks can only reside in a Tasks folder; markers can only reside in a Markers folder, etc. To create additional folders, right-click on a folder and choose Add Folder. You cannot delete the default Tasks, Markers, Video Clips, Graphs, and Title Clips folders created by Manager within a project. To delete any other subfolders you have created in the Project pane, right-click the folder and select Delete Folder.